A hearty dish to warm you through. In a saucepan, add the fish stock and bring to the boil. Once boiling whisk in the miso, and keep hot. 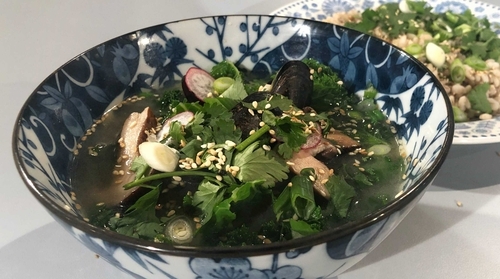 Grab a frying pan, place on high heat, when hot add some sesame oil followed by the mushrooms and mussels, quickly pan fry until the mussels start to pop open then transfer to the pot along with the kale. Bring to the boil then add to some bowls, sprinkle each bowl with the spring onions, radishes, sesame seeds and a drizzle of oil. Enjoy with some cooked rice or noodles, but my favourite is pearl barley.